I was just about to say the same thing. Would not surprise me at all if the cyclone warning was downgraded later this morning, on account of Penny not getting her act in gear quickly enough. Welcome Penny hopefully you follow in your brother Owen's footsteps. Happy New Year, and Happy Birthday to Penny! Tropical cyclone Penny has formed in the eastern Gulf of Carpentaria. Expected to cross the coast near Weipa this afternoon. Pormpuraaw to Cape York, including adjacent inland areas. Location: within 35 kilometres of 12.7 degrees South 140.9 degrees East, estimated to be 110 kilometres west of Weipa and 115 kilometres northwest of Aurukun. Movement: east southeast at 8 kilometres per hour. People between Cape York and Pormpuraaw should take precautions and listen to the next advice at 11am AEST. The next advice will be issued by 11:00 am AEST Tuesday 01 January [10:30 am ACST Tuesday 01 January]. ACCESS r showing some east /west elongation along the trough line today. The central core of TC Penny the far nth east coast tomorrow morning. some increase of wind and gusts on coconut and Thursday island . At least we will get direct observations for a change. Will be interesting to compare actual data to the satellite measurements/estimates. Question from afar. Once Penny enters the Coral Sea what are the chances it will reform and cross the Queensland coast as a cyclone? Some models at this stage indicate that it will reform, and then approach the QLD coast next week. A week is a lifetime in model runs though, so much can change. 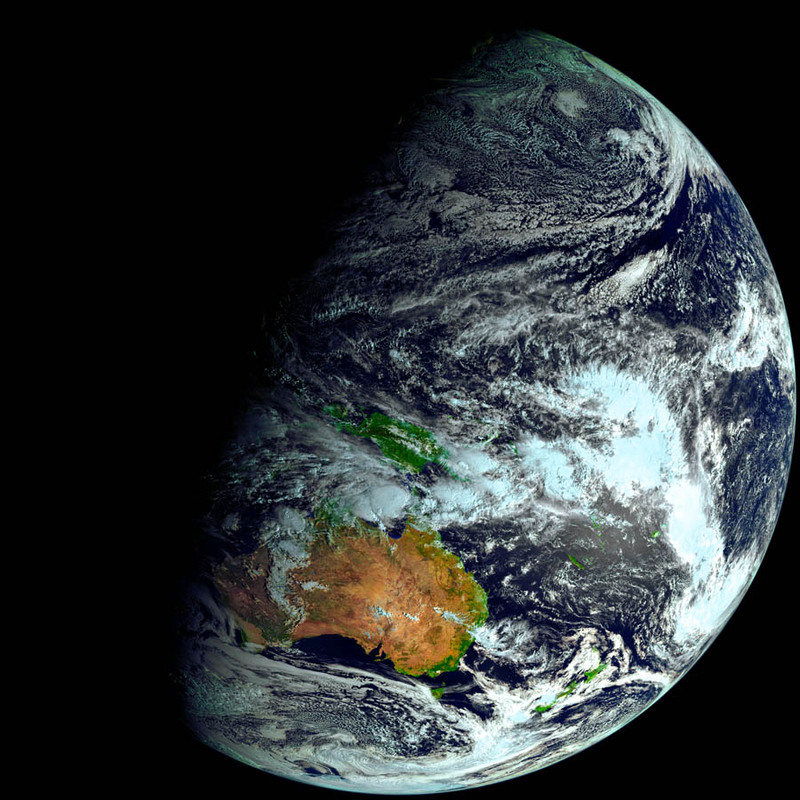 Cyclone Penny from Himawari 8 this morning at 8am. Vis, B4 and B5 channels used. Looks pretty bland at the cloud tops. Bland? That is a beautiful cirrus shielding with poleward outflow channels, indicative of a system that can rapidly intensify. Even has the look of her starting to form a CDO and an eye. I really want an eye, but I may have to wait until it gets into the Coral Sea. Amazing images L jet ! I think one of the less obvious things to also consider is any potential effects on Penny’s track from the secondary multiple small lows off the north coast along the monsoon trough. In saying that, any effect may only amount to a small wobble or deviation in Penny’s track after it gets to the other side of the Cape but the westernmost low is a bit punchy. Tropical cyclone Penny is moving slowly east and expected to cross the coast near Weipa this afternoon. Location: within 35 kilometres of 12.7 degrees South 141.1 degrees East, estimated to be 90 kilometres west of Weipa and 100 kilometres northwest of Aurukun. Movement: east at 9 kilometres per hour. 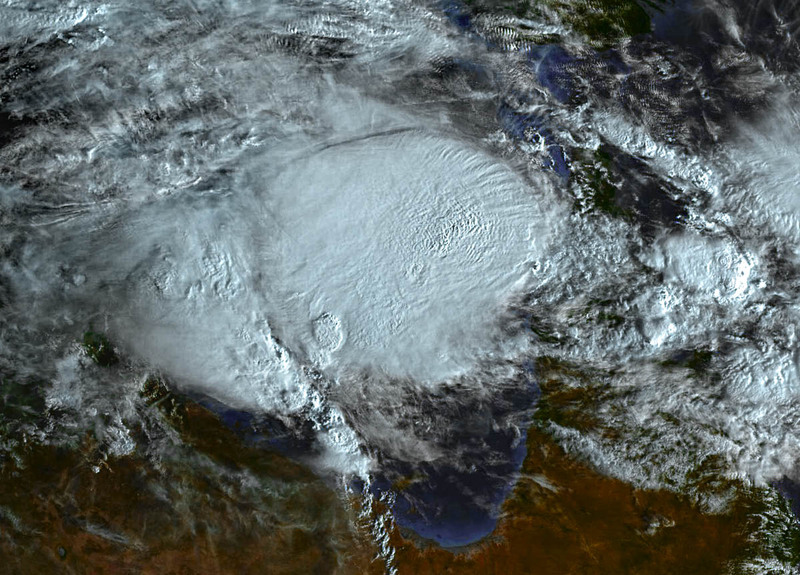 Tropical cyclone Penny formed in the eastern Gulf of Carpentaria earlier this morning. Penny is moving eastwards towards Cape York Peninsula and is expected to cross the coast near Weipa this afternoon as a category 1 system. The cyclone may reach category 2 if it moves slower than expected and spends more time over water. GALES, with gusts up to 120 km/h are occurring on the western Cape York Peninsula coast between Cape York and Aurukun. Gales are expected to extend south to Cape Keerweer and to adjacent inland areas of western Cape York Peninsula this afternoon and evening as the cyclone approaches the coast. Gales may extend further south to Pormpuraaw later today if the cyclone takes a more southerly path. Isolated damaging wind gusts may occur otherwise with monsoonal thunderstorms over the Torres Strait Islands and northeast Cape York Peninsula, and a separate Severe Weather Warning is current for these conditions. People between Cape York and Pormpuraaw should take precautions and listen to the next advice at 2pm AEST. The next advice will be issued by 2:00 pm AEST Tuesday 01 January. Ken, I like what you mentioned earlier about Wind Shear. I know the usual pundits may complain about the system not firing as they'd like, however the reality is when one looks at the level of Wind Shear around the System itself (in knots) - particularly to the North and North West, it appears consistent with expectations I think. The next few TC update should be very interesting for the QLD coast. To me it looks like you are in kind of an eye. A calm zone. It should pick up again. My impression is that the system has a large eye/center currently over Weipa. The heaviest activity is to the north of the center/eye and may move further east to impact Weipa later tonight. 4 registered (Knot, ScubaSteve, 2 invisible), 62 Guests and 3 Spiders online.